In 1946, when Nat King Cole crooned "Chestnuts roasting on an open fire…" he probably didn’t realize he was singing the line that would one day put chestnuts on the gastronomic radar for most of the American population. At the time he sang, chestnuts were a ubiquitous part of Christmas tradition across the U.S., both at home and on the street. Christmas stuffings and cakes groaned under the weight of added chestnuts; in the big cities roasters plied the streets like espresso carts do today. What nobody could foresee was that within a few short decades the omnipresent Christmas nut would have disappeared entirely, its presence in songs outlasting its presence on our tables. From a time when you couldn’t step sideways in December without bumping into a chestnut, what sent us spiralling downhill to the point where the the average annual consumption for every man, woman and child in America can be measured in a fraction of a nut? Chestnut trees once grew in abundance in temperate climates all over the world, from East Asia to North America, and were particularly abundant in southern Europe. In France, Spain and Italy the chestnut was vital to human survival for several centuries, as it provided a cheap and plentiful source of calories in the winter when not much else would grow. Because of its starchy composition it was widely used as a replacement for flour, and dried milled chestnuts were put through their paces as the backbone of breads, porridges and pastas. Particularly popular were cakes that capitalized on chestnuts’ inherent sweetness; today recipes for these can still be found: castagnaccio in Italy, pisticcine in Corsica and délice à la châtaigne in southwest France are all variations on a dense, moist and subtly-sweet theme. In North America, there used to be no shortage of chestnuts either. One out of every four trees within the 200 million-acre forest that stretched from Maine to Florida and west to Ohio was a chestnut, and the trees were so visible in the forests that during summer when the tree flowered, many people believed the Appalachians to be snow covered. It’s well documented that Native Americans in many areas were eating chestnuts for generations before the arrival of Europeans, and the early settlers found many uses for both the nuts and the wood. Many recipes published around the turn of the 20th Century included chestnuts as an accompaniment to or replacement for more expensive ingredients; tons of nuts were packed and shipped by train to large cities for street vendors to roast during the holidays. Then in 1904, the chestnut blight struck. In that year a shipment of Asian chestnut trees was planted on Long Island; what nobody knew was that these trees carried a lethal fungus that the American trees had no resistance to. Within the next fifty years nearly all native American chestnut trees were wiped out. Chestnuts went from being a ubiquitous winter crop to being practically non-existent; generations of Americans grew up without ever so much as tasting one. My first experience with chestnuts came from a street vendor in Spain, where they still grow in abundance. I was mesmerized by how different they were to my expectations – they tasted nothing like a nut, but more like a nugget of some crumbly primeval sweet potato. I later learned that they probably do have more in common nutritionally with a potato than other nuts, and also that different preparation methods affect their character substantially. While roasting concentrates their flavors and produces a drier, chewier specimen, boiling, particularly in milk, causes the kernel to swell slightly and become moist, tender, and almost buttery. Whichever way they’re prepared, though, once coerced out of its leathery peel, the chestnut dissolves into your mouth with a sigh of crumbly richness, warm and ancient and comforting – a perfect antidote to winter frosts. Now that chestnut trees are being slowly reintroduced to North America, it’s becoming easier to get ahold of them. These days you can buy American-grown chestnuts at farmer’s markets and over the internet, and imported fresh, canned or vacuum-sealed varieties can usually be found in gourmet supermarkets. In whichever form you have them – and after you’ve roasted yourself a few over an open fire, just for the experience – this soup is a wonderful thing to do with them. The chestnuts’ sweet earthiness combines beautifully with roasted hazelnuts and hearty root vegetables into a silky, nutty, slightly sweet bisque, subtly accentuated with a few drops of hazelnut liqueur. It may not make up for all those chestnut-less years you may have suffered, but it will keep you warm and sated through plenty of sidewalk-shoveling, snowman building, and of course, singing along with Nat King Cole. Note: Always puncture the shells of chestnuts before cooking to prevent explosion(!). To do this carve an X into the bottom end of the shell with a paring knife, taking care not to puncture the nut inside. To roast chestnuts over a fire, place the scored nuts in a foil pie tin punched with holes, sprinkle with water, and place directly on hot coals. Shake a few times during the roasting to prevent charring. When a fire is not roaring and ready for nuts, any oven will work. Roast the nuts at 375 degrees for 20 minutes or so, until the scored corners of the skin curl back, and peel while still hot. Alternatively, to boil place the scored nuts in a saucepan and cover with either milk or cold water. Bring to a boil and simmer for 15 to 25 minutes, then peel. Melt the butter in a large stock pot over medium heat. Add the bacon or pancetta, onion, celery, carrots, garlic and thyme. Sauté until the vegetables begin to soften, about 10 minutes. Add the wine and stock, and stir in the chopped chestnuts. Heat to a gentle boil. Reduce the heat and simmer uncovered 45 minutes, or until everything is soft and the flavors have blended. Remove the soup from the heat and stir in the hazelnuts, cream and Frangelico. Puree the soup in batches in a blender or in the pot with an immersion blender until it’s as smooth as you can get it. Pour into a clean pot, taste and adjust seasonings, and rewarm gently. Ladle the soup into small bowls and garnish with a dollop of crème fraîche. Hi Melissa, what a heartwarming bowl of soup! It seems like the perfect thing to eat to warm your toes on a cold day. Your picture is gorgeous and I would love to know how you got that dollop of creme fraiche to sit there so patiently on the top of the soup while you took the picture. I’ve tried to do that before and found it sank right to the bottom of the bowl, and completely out of sight! Great writing, as usual! I wondered why chestnuts are so expensive now… The Chinese roast them in the oven. How delicious! Looks like a wonderful recipe. And I love your background information on the chestnut trees. They are spectacular when they bloom. Question: what does this soup go with? Or is it so hearty, it’s pretty much a meal on its own? How very quinessentially fall! Love the write up, as usual – wonderful information, and totally sets the stage (or table, so to speak) for the tasty treat for a finish. And I do think you must have had some particularly well-behaved creme fraiche (as per Michele), all to often I’m fiddling with my camera and must proud little quenelle is suddenly a sad little blob. Hi Melissa,The photo makes the soup look simply delicious. I almost feel like plucking the spoon out from my monitor to have a taste of it. It doesn’t ever get cold enough for soups here, but I do enjoy them from time to time, especially when it rains. Thank you for sharing this! 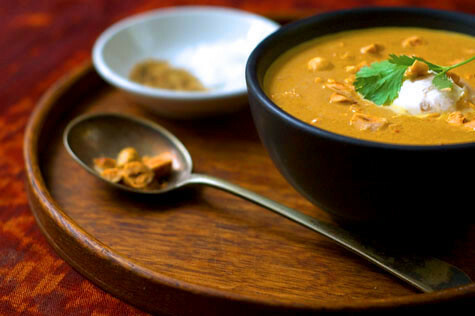 Hi Melissa – this is such a gorgeous looking/sounding soup! I’m definitely going to love this, although I might use a bit less Frangelico… Thank you for the lovely recipe, as always.